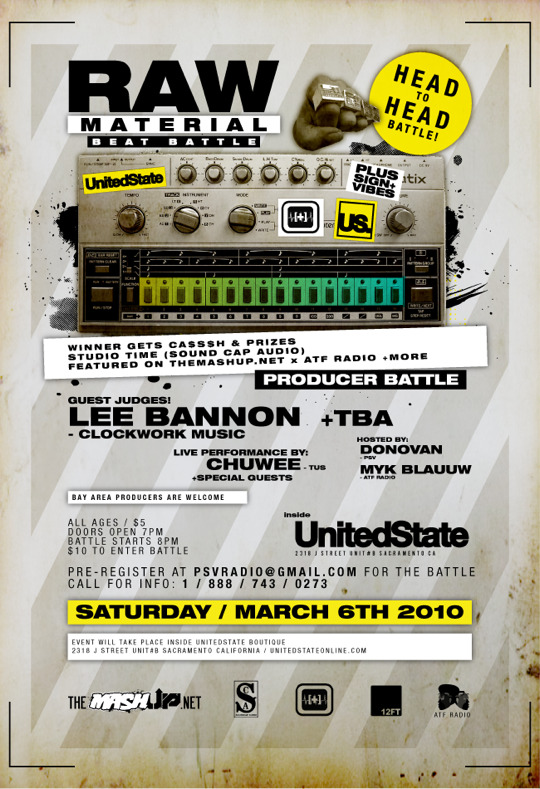 The Raw Material producer beat battle will place at UnitedState, a Sacramento DJ/Clothing boutique. Featuring judge Lee Bannon and hosts Donovan and Myk Blauuw, the event pits budding beatmakers in head-to-head competition for prizes that include cash, studio time, and online profile features. I blog frequently and I seriously thank you for your information. The article has truly peaked my interest. I’m going to bookmark your blog and keep checking for new details about once a week. I opted in for your Feed too. Saved to fav this excellent website and added in your current RSS feeds to my mobile phone, enjoyed reading this a bunch man! Thank you for a tremendous publish and an all-around satisfying weblog! a pain to keep clean. Might get them so i can add for the collection. to peer your post. Thanks a lot and I’m looking forward to contact you.